Furloughs May Not Save As Much As States Hope Nineteen states have imposed or are considering unpaid time off for government workers as a cost-saving measure. But with the drop in income, workers are spending less, which harms the local economy and costs the state in lost taxes. 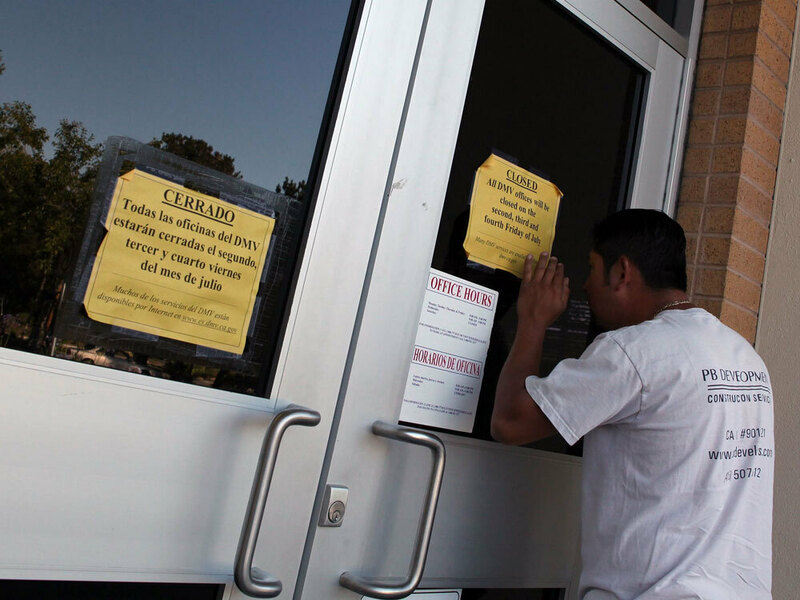 A man peers through the door of a closed Department of Motor Vehicles branch in Corte Madera, Calif. In an effort to close a $26 billion budget gap, California Gov. Arnold Schwarzenegger ordered three work furlough days per month, leaving most state offices closed. This week Colorado became the latest state to force government workers to take unpaid time off in an effort to save money. At least 19 states have imposed furloughs in the past year or are considering them. But economists have yet to determine just how effective furloughs are as a tool for state cost-saving. It is beginning to appear that a decline in spending, and therefore tax revenue, and the drop in efficiency associated with furloughs may offset their value. California, which is experiencing the biggest state budget crisis in the country, has been furloughing state workers since February. On three designated furlough days each month, almost 200,000 state workers across California take a forced day off. The practice is supposed to help shave $1.3 billion off the state's budget expenditures this year. But the costs to the state may offset a lot of the savings. Gabriel Taylor, an engineer for a California state agency, says the unpaid days off are having a big impact on his spending. "In theory it's a 14 percent pay cut, but in practice for me it seems a lot more than that because my fixed costs — mortgage, my food — account for a lot of monthly income, and this comes off the excess," Taylor says. "So it's cut my disposable income, so to speak, down by about 50 percent." Taylor says he's not going out to eat as much as he once did and he's putting off a home remodeling project he'd been planning for some time. His cutbacks hurt local businesses, but they also cost the state money in lost taxes. Sacramento restaurant Kabul Kabob Cuisine has a sign in the window that reads: "When state workers lose, we lose." Owner Hemayat Sawez says Fridays used to be his busiest time, but business on those days is now down as much as 60 percent. The rest of the week isn't much better, he says. Squeezed workers are packing their own lunches. In addition to lost spending and tax revenue, there are the costs to the state from service disruptions. Some are obvious, like people taking more time off from private sector jobs because of longer wait times at public offices like the Department of Motor Vehicles. Then there are blips, like a truck spilling wine cork lubricant all over a Northern California freeway. "There was a two-hour delay in sending a cleanup crew. Overall, it took 12 hours to clean up," says Ken Jacobs, chairman of the University of California, Berkeley, Labor Center. The spill took place on a Friday, a furlough day, and there was no one to go out. Debacles like these end up costing the state money. Jacobs says furloughs also cost the state money directly when agencies that generate revenue shut down, sometimes to the tune of hundreds of millions of dollars. John Sullivan of San Francisco State University is skeptical that the furloughs — seven weeks' worth in California this year — will save the amounts they are intended to. He has analyzed the effect of furloughs at private firms and says they can end up costing companies about double what they set out to save, through lost productivity, poor morale and poor quality control. Most important, Sullivan says, companies run the risk of losing their best workers. He says furloughs may be trendy now, but these kinds of cuts across the board don't make sense. "It's just like if you had a cancer," Sullivan says. "You don't really want to cut off 10 percent of your whole body; you really want to target on the cancer." Sullivan says focused layoffs would be a better solution. But not always. Professor David Levine at UC Berkeley's Haas School of Business says some furloughs can be very effective — especially when company executives make a good case for the belt-tightening and are making sacrifices too. "The main thing managers need to think about is just that the communication is clear and credible so that they're not destroying what in many companies is much more valuable than the plant and equipment, which is the skills and commitment of their workforce," Levine says. Furloughs, he says, may be a better option than layoffs. When the economy recovers, your workforce is still there. Still, hard numbers on the bottom line are difficult to come by. Berkeley labor researcher Jacobs says few economists have looked at this. "I suspect having gone through this economic downturn, now that there will be a lot of data about what happened, this will keep economists busy for a while," he says. Jacobs says he is already at work with colleagues on the question.